This rendering provided by the Harvard-Smithsonian Center for Astrophysics shows the newly discovered world HAT-P-1, the largest and least dense of nearly 200 worlds astronomers have found outside our solar system. A strange planet "lighter than a giant ball of cork" and possibly the earliest known galaxy have been discovered by researchers using telescopes on Mauna Kea and elsewhere. 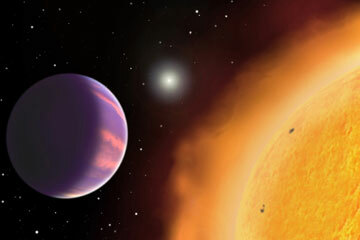 Harvard-Smithsonian Center for Astrophysics researchers found the new planet orbiting one of a pair of distant stars 450 light-years away in the Lacerta constellation, according to a news release from the center. Gaspar Bakos, Hubble fellow at the center, designed and built a network of small automated telescopes known as HAT, which were used to detect a planet "unlike any other known world." There are two HAT telescopes at the Submillimeter Array facility on Mauna Kea and four at the Smithsonian Astrophysical Observatory's Whipple Observatory in Arizona. Robotic observations were made every clear night, with each telescope covering a region of the sky with every exposure 300 times larger than the full moon, the news release said. The new planet, called HAT-P-1, is the largest known planet, with a radius about 1.38 times Jupiter's but with a mass only half that of Jupiter's, researchers reported. It could be an entirely new class of planets, said Bakos, lead author of a paper on the discovery submitted to the Astrophysical Journal. "The planet is about one-quarter the density of water," he said. "Just like Saturn, it would float in a bathtub if you could find a tub big enough to hold it, but it would float almost three times higher." The findings on galaxies were reported in two papers in the journal Nature by teams using data from the Hubble Space Telescope and the giant Subaru Telescope on Mauna Kea. "It is an interesting glimpse into the origins of galaxies," said J. Patrick Henry, University of Hawaii professor of physics and astronomy, who has a NASA/Chandra X-ray Observatory science center branch. In galaxy research, he said, "Up to now we were trying to understand newborn babies by looking at 3-year-olds. Now we have been able to look at one newborn baby. So that tells you something about how newborns are, but maybe the one you know isn't typical. ... We haven't really been able to see back to where galaxies were first forming," Henry said. "We're trying to understand how they formed by looking at ones we can see several million years after they were formed. "This is possibly the first glimpse at a newly formed galaxy, but only one of them, so who knows if what you're looking at is typical?" University of California-Santa Cruz researchers Rychard Bouwens and Garth Illingworth found a tenfold increase in the numbers of galaxies over 200 million years, according to a New York Times News Service report. The number of galaxies seems to have increased drastically, from 700 million to 900 million years after the big bang, the scientists said. A Subaru Telescope team led by Masanori Lye of the National Astronomical Observatory in Tokyo reported a similar jump in galaxy counts in the same period. The team said the galaxies include the earliest galaxy yet confirmed, just 750 million years after the big bang, or about 12.8 billion light-years from Earth. Illingworth said the galaxies his research group saw were one-tenth the size of the solar system's Milky Way galaxy. He termed them "the seeds" of galaxies like ours. "Advanced technology allows us for the first time to observe the opening chapter of Genesis," commented Abraham Loeb of the Harvard-Smithsonian Center for Astrophysics.